STUDY OF HPD'S TASER USE NOW RELEASED: WHAT DO THE STATISTICS SAY? The determination of whether CEDs reduce injuries and/or deaths to officers and citizens by providing an alternative to deadly force. The determination of whether CEDs involve racial profiling or are being used to gain compliance from combative suspects. To obtain the valid aggregation level and inference — while also accounting for potentially confounding factors — we examined the probability of CED incidents in Houston as a function of individual and contextual factors, individually and combined. The examination of CED incidence data provided by the Houston Police Department possess unique measurement, sampling, and timing challenges. These challenges required a comprehensive approach involving several tools that minimized the threat of drawing false inferences from the data. According to the statistical team leader Jim Granato, "When reviewing the CED audit, it is important to note that CEDs are rarely used by HPD. CEDs were deployed in less than 1% of incidents occurring during the review period. However some patterns of use have emerged, which could warrant enhanced officer training." Read an overview of the study. 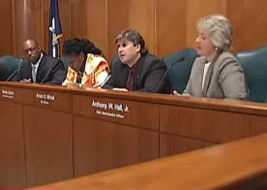 Review the entire City of Houston performance audit of CED use. Using the Hobby Center for Public Policy's visualization tool, you can analyze the statistical data involved in the study. Online users can choose from numerous demographic variables and city council district level data to see and compare election results in a dynamic graphic format. Pick any combination of variables and see the results instantly. Double click the icon on your desktop. Hit the extract button - a folder called "cedview" will appear on your desktop. Double click on the "cedview" folder to open it. Double click on the "cedview.exe" file to launch the visualization. Select the "File" menu and choose "Load Data" from the menu. For instructions on navigating the CED (Taser) Visualization software, please download the CED View Operating Manual.